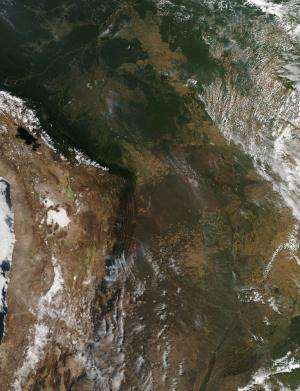 The location, widespread nature, and number of fires in this satellite image suggest that these fires were deliberately set to manage land. Farmers often use fire to return nutrients to the soil and to clear the ground of unwanted plants. While fire helps enhance crops and grasses for pasture, the fires also produce smoke that degrades air quality. In Mozambique and Madagascar, the growing season runs from the first rains in October – November. Thus, the clearing of lands in early September heralds the new growing season. Sadly, according to reports in the National Geographic, "Some 90% of the once-green isle of Madagascar has been deforested via a combination of slash and burn agriculture for rice cultivation and doro-tanetry, a less intensive burning used to augment grass growth for cattle grazing." The Moderate Resolution Imaging Spectroradiometer (MODIS) on NASA's Aqua satellite detected hundreds of fires burning in Mozambique and Madagascar on September 11, 2013. The fires are outlined in red. Most of the fires burn in grass or cropland, which is tan in this image.